A 6-year-old girl presented with localized swelling and redness located anterior and inferior to her right ear. There is a history of intermittent swelling in this region with fever and purulent drainage from the ear. 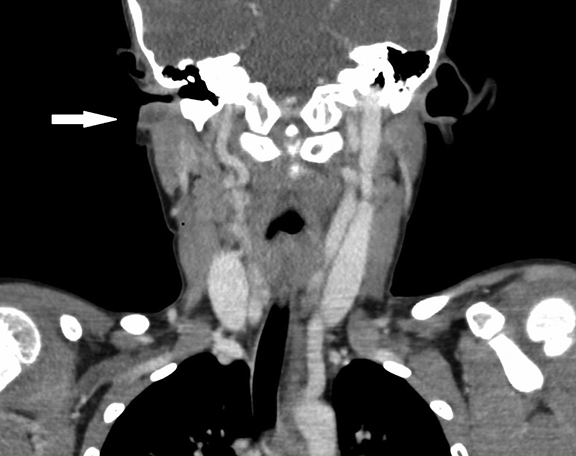 Axial (Figure 1A) and coronal (Figure 1B) images from a CT examination of the neck with IV contrast show a complex, rim-enhancing lesion in the right parotid region, just inferior to the right external auditory canal. Differential diagnoses include: suppurative abscess, benign lymphoepithelial cyst, venolymphatic malformation, and nontuberculous mycobacterial adenitis. There are 6 pairs of branchial arches, which appear around the 4th week of gestation. These arch pairs are separated by 5 clefts externally and 5 pouches internally.1 The branchial arches fuse and the clefts are obliterated by the 7th week of development. The cavum conchae, the external auditory canal (EAC) and the external layer of the tympanic membrane are the structures derived from the first branchial cleft.3 First branchial cleft lesions result from incomplete fusion of the ventral portions of the first and second arches.3 First branchial cleft anomalies are associated with the parotid gland, as closure of the branchial clefts is concurrent with the emergence of the developing parotid gland and migration of the facial nerve, which originate from the second branchial arch.1 First branchial cleft malformation develops more often near the ear and parotid gland than the hyoid region. First branchial cleft malformations are often under recognized and mistaken for other inflammatory lesions in the periauricular and cervical region. Complete removal is needed to prevent recurrence or secondary infection; therefore delay in recognition can lead to complications. 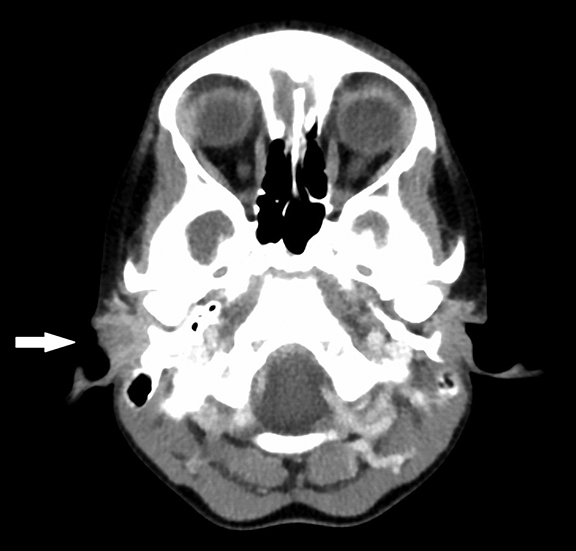 This entity should be considered in all patients with chronic, unexplained otorrhea or recurrent parotid space abscess. Koeller K, Alamo L, Adair C, et al. Congenital cystic masses of the neck: Radiologic-pathologic correlation. Radiographics. 1999;19:121-146. Benson M, Dalen K, Mancuso A et al. Congenital anomalies of the branchial apparatus: Embryology and pathologic anatomy. Radiographics. 1992;12:943–960. Arnot R. Defects of the first branchial cleft. South African Journal of Surgery.1971;9:93-98. Work W. Newer concepts of first branchial cleft defects. Laryngoscope. 1972; 82:1581-1593. Olsen K, Maragos N, Weiland L. First branchial cleft anomalies. Laryngoscope. 1980; 90:423-436. Triglia J, Nicollas R, Ducroz V et al. First branchial cleft anomalies: A study of 39 cases and a review of the literature. Arch. Otolargyngol. 1998;124:291-295. Pediatric Radiological Case: First branchial cleft anomaly. Appl Radiol. Prepared by Dr. Thomas, Pediatric Neuroradiology Fellow; Dr. Jorgensen, Body Imaging Faculty; and Dr. R. Towbin, Radiologist-in-Chief, all at Phoenix Children’s Hospital, Phoenix, AZ; and Dr. A. Towbin, Pediatric Radiology Faculty, Children’s Hospital Medical Center, Cincinnati, OH.